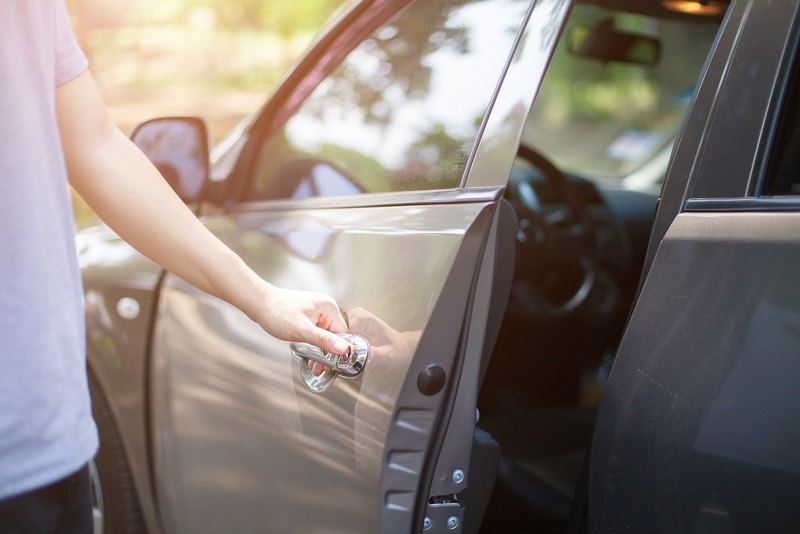 Car Lockout : Getting locked out of your car can be a very stressful experience, but it is always important to stay calm as improper methods of opening your vehicle may harm it. There is a vast array of tools that Auto Locksmiths use to open a car that have the keys locked inside the car, broken in a lock, or simply lost. The Slim Jim is perhaps the most commonly thought of tool for opening a locked vehicle but is only effective on cars with upright style locks. The Slim Jim method varies depending on the make and model of the car but is predicated around the idea of slipping the tool between the weatherstrip and moving it until the upright lock is moved. Once the tool has found the locking device, the Slim Jim must hook the lock and be slid up to unlock the car. This process requires a lot of finesse as this part of the door has many wires and electronic mechanisms that can be disrupted, harming the car if done unprofessionally. A more common practice in car lockouts is the use of wedges. Wedges vary in size and shape to accomplish success with a vast number of different makes and models. Though some wedges may seem more refined than others they are used because of their proven track records and will not harm the vehicle. The wedge serves as a way to create an opening in the door so another tool may be used to unlock the car from the inside. Once the wedge is in place a Lasso Tool may be used for an upright door lock. This tool grasps the lock with a small lasso so that the lock can be pulled upwards to unlock the car door. A rod may be used for push or slide buttons if the car does not have upright locks. More specialized tools act in a similar fashion to the Slim Jim, in terms of a wedge free entry. The Japanese Tool (named for its use predominantly on Japanese manufactured cars) is dropped down between the weather strip and the windowpane and comes up on the other side of the glass to manipulate thumb style locks. The Auto Buster (perfect for GM cars) enters the car just like the Japanese tool, but due to its shape can more adeptly press sidelocks or use side sliding locks. Locked Keys In Trunk : Your keys can get locked in the trunk of your car for many different reasons. Whatever that reason may be, you can be sure that our experienced auto locksmith can get your keys out, and get you back on the road. It does not matter what type of car you have, or the security that the vehicle is using. With a professional auto locksmith, the trunk of your car does not stand a chance. It will be opened as quickly as possible without any unnecessary harm being done to the car. In most cases, a set of keys that has been locked in the trunk is no different from a standard car lockout. The auto locksmith will simply open the door to your car and then use the manual trunk release. If the care has deadlock features that prevent this type of entry or no working manual trunk release, then the issue will get a little more complicated. Still there is no reason to fret. The technicians at Quad Cities Locksmith have the skills and knowledge required to get into any car. Additional safety features on a car will take more time to work around, but ultimately they will not be an issue. Car security is not perfect. This is a scary premise, but fortunately for you, it means that an expert auto locksmith will always be able to open your locked trunk. Security will always buy you more time, and in this case, the better security your vehicle has, the more time you will have to wait to get back into it. Car Key Replacement : Cars that cannot be opened by any of these means will most likely need a key to be made. This can be done even if there is not and extra key, by using what is called a code machine. The code machine allows a replacement key to be cut by code, which is also ideal if you have lost your keys and do not have a duplicate. The key making service is also perfect for being secured against most types of lockouts. Having an extra key at home or in the hands of a friend or family member conveniently allows for lockout protection near and around your home. The key making process will vary in time needed, depending on how complex the key is. Car Key Cutting : The process of cutting a car key uses specialized machines. These will use metal cutting tools to grind away the softer metal of the mechanical key. The metal of the key cutter’s blade must be harder than the metal of the key. The average key is made from brass, which is a metal used for key making due to its machinability. It is hard, resistant to weathering, and does not corrode easily, but it is still easy to machine. This makes it the ideal material for a key. With a key cutter that uses a hardened steel blade, shaping the physical key is very easy. The key cutter takes a full blank, which will have the proper warding for the car cylinders. Within general standard cut that a particular manufacturer uses, some models will have a different key blank. Often the different key will be based on the year of the car, but higher end models may also have dissimilar keys as compared to lower priced models from the same year. A locksmith’s expertise will be needed in order to guarantee that the correct key blank is being cut. Without the correct blank, even if the key is cut from code, it will not have the proper shape to open the locks or work in the ignition of the car. Transponder Key Programming : Beginning in the late 90’s transponder chips began to be integrated into car keys. This was done to provide additional security to the vehicle. With this chip installed in the plastic cover the key, a message could now be sent to tell the car that this key was more legitimate. This is meant to help prevent things like hot wiring and slide hammer attacks. With a transponder key, simply copying the bitting on the key blade will not give you the ability to start the vehicle. When the car has the properly shaped key inserted, it sends out an electric charge. This powers the transponder chip, which allows it to send a message to the transceiver of the car. When the transponder is not programmed or non-existent, the transceiver of the car will not get the correct message. This message is a digital key. The car will not start without both keys. Most often, transponder key programming will go hand in hand with cutting a new car key, but this is not always the case. Keys can be cut at a different location and then brought to the locksmith for transponder programming. This will require that the key that has already been cut does have a transponder chip in the assembly. If it does not, a new key that has a transponder will need to be cut. With the programing service customers can also elect to have the existing transponder keys removed from their car’s computer, so that no keys will work except for the new ones.